Venezuela is facing a coup attempt which has gained enthusiastic backing from the US and its allies. Fortunately, people are already fighting back against US interventionism. The Canary spoke to activists who have been organizing to oppose Washington’s hypocritical meddling and support national sovereignty for the Venezuelan people. 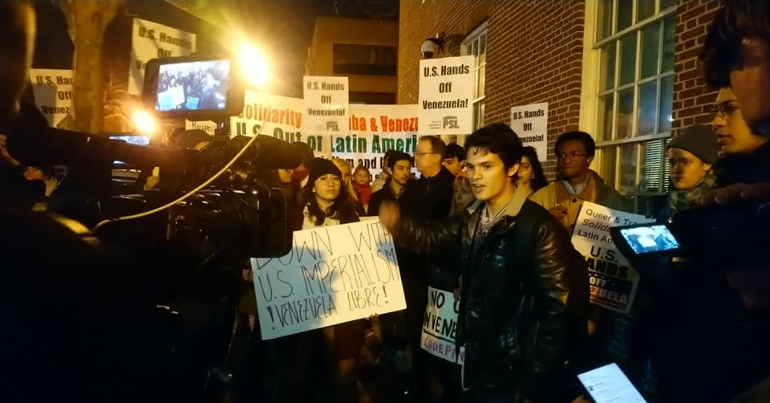 After Donald Trump’s official backing for the coup came on 23 January, demonstrators soon gathered outside the Venezuelan embassy in Washington DC to protest against the attempt to delegitimize Nicolás Maduro’s government in Venezuela. Organized by a coalition of progressive groups, protesters held signs and chanted slogans denouncing Trump and his vice-president, Mike Pence. We’re absolutely horrified about what’s going on in Venezuela and the fact that both our president and vice-president have come out and said that they would recognize the head of the national assembly, who’s never been elected president, as the leader of Venezuela. The US has been trying to overthrow the Venezuelan government for years now with economic sanctions that have really hurt the people and resulted in a horrible crisis. And our hearts really go out to the people of Venezuela. But we also know the history of US-supported coups in the region and around the world and how they have resulted in tremendous violence and worsening economic situations. So we’re here to say that the United States should get out of the way. It has no business interfering in the internal affairs of Venezuela. There are human rights abuses in many countries in Latin America and we condemn all human rights abuses, but it is not for the United States to pick and choose which government it is going to call a dictatorship, which government it’s going to strangle economically, and do it in the name of human rights. I’m not here to defend the Maduro government. I know the Maduro government has made lots of mistakes. And I know that economic sanctions have made it really very difficult for them to manage the economy. But our role is not to say that another country is so violating of their economic situation or their human rights that we can agree to a coup. Coups are not the right way to change governments. The opposition in Venezuela has been notoriously divided and they weren’t able to put forward a good candidate or a good campaign and so they weren’t able to win the election. It’s not up to our government or the Canadian government or other right-wing governments in Latin America to create a situation where they recognize a leader that was never elected. That is pretty much a definition of a coup. And we’ve seen it before. And it works out very badly. We don’t believe, and I don’t think any justice-loving people or any people who believe in law can believe, that the US government here in Washington DC can determine who the president of Venezuela will be or won’t be. So here we see again the United States government interfering, meddling, colluding, carrying out regime change. Hopefully, they won’t succeed. But that certainly is their goal. When Maduro – when the Venezuelan Bolivarian political parties win an election, the opposition and the United States government always say: ‘It’s not a valid election; it’s not a free and fair election.’ If the Maduro government and his political party lose the election, they recognize and have recognized the election as valid. The opposition then takes its seat, as it did in the parliament. So the opposition that is backed by the United States will never accept as valid an election where the existing ruling party wins. That’s the reality. Maduro’s party has won over and over and over again. It’s a democracy. Are there human rights abuses [in Venezuela]? Well, you could say there are human rights abuses in every country in the world. The United States has 5% of the world’s population but has 25% of the prisoners in the world. Is that an abuse of human rights? I would say it is. The United States invades and occupies other countries. Is that a violation of those countries’ and those people’s human rights? Of course it is. Does that mean another country can say: ‘Hey, we’re going to determine who the president of the United States is?’ Absolutely not. Again, you can’t use human rights pretextually as an excuse to carry out an imperialist agenda. But that, in fact, is what Donald Trump is doing in Venezuela. I think we’ve reached a tipping point. This is not like earlier attempts to carry out a coup. This is a concerted effort by the United States and all of its proxy powers in the Western Hemisphere, including Canada and the entire Lima Group, to undo the Venezuelan government. That said, Venezuela is not completely isolated. Nor is Maduro completely isolated. He has a big base of support amongst the country’s poor. And they are the majority. He has alliances both with Russia and with Iran, with China, even Turkey recently. It does not stand alone. Undoubtedly, there are some strong voices of resistance against the Trump administration’s agenda taking to the streets of the US capital. And the people who take time out of their schedules to oppose US intervention deserve our praise and support. Because only by standing up and being counted can we mount a serious challenge to Trump and the imperialist political class that he represents.